Welcome to my first ever Festive Friday! It may not be every Friday that I’ll have a Christmas project but I’m aiming for at least two a month to get a head start on my Christmas preparations. This card uses the same paper pack, embossing folder and layout as my previous one, but I changed the embellishments. I used the solid image from Wondrous Wreath in Momento Black on Very Vanilla and cut it out with the coordinating framelit. (Note: I used Momento instead of Archival Black as the snowflakes are a muted black and the Archival Black was too dark). “Merry” was diecut from Gold Glimmer paper using the Christmas Greetings Thinlits and the stars are from the Mini Treat Bag Thinlits. I haven’t really used the stars, hearts and dots from this set much until recently and I’m so glad I discovered them, they’re the perfect “little” embellishment. When I was working on these cards it was the winter school holidays and we were quite happy to slow down and take things easy. The sentiment on this card summed up just how we were feeling and this is the card that resulted. It didn’t turn out quite as I’d pictured but my youngest son loved it and it’s going to be his card this year, so I guess that’s all that matters. It’s supposed to be a snowman relaxing in his hammock during a busy Christmas season and even though there’s a lot of detail I still think it’s missing something, I’m just not sure what! The candy canes, snowman, holly and hat were diecut using the Snow Friends framelits (a carryover from last years’ holiday catalogue). The berries on the holly are the dots from the Mini Treat Bag Thinlits and the hammock is from the Everyday Jars framelits. The sentiment is from Snow Place and the snowy hill was cut freehand. Inside is another sentiment from Snow Place. 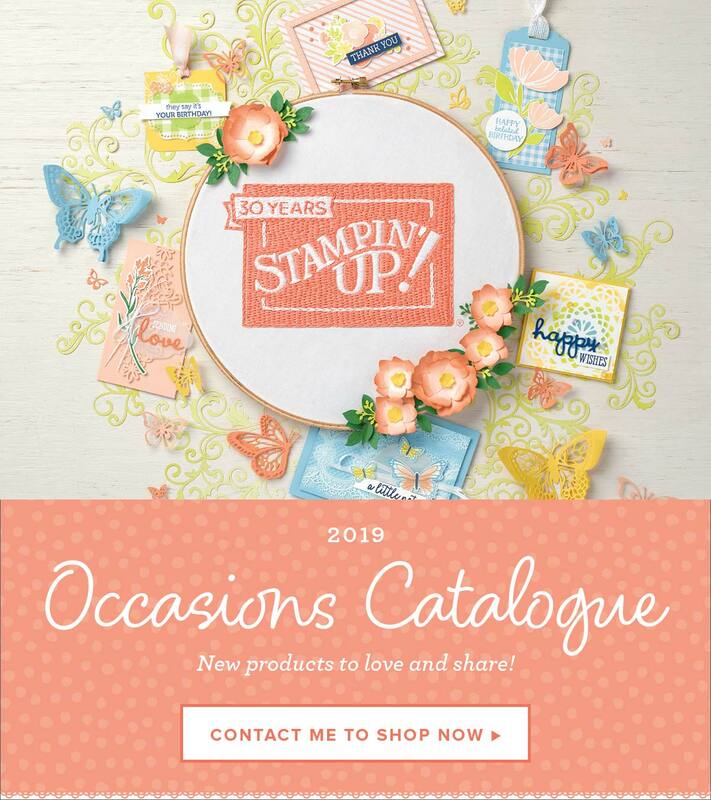 The Holiday Catalogue will be coming soon and I’m looking forward to sharing ideas using some of the great new product that I know will be in it. However, there’s lots of choice in the annual catalogue if you want to start now, which is a great option for those who have a lot of seasonal lovelies to create. I hope you enjoyed my first Festive Friday, and that you’ll come back soon.